BRENDAN Gormley was grabbing a coffee on the Via della Conciliazione in Rome when a swarm of people crowded round the shop. He thought the worst but let out a sigh of relief when it was just Pope Francis wandering freely through the streets. “He’s a bit impromptu like that,” the 46-year-old deacon said. Deacon Brendan has lived in Rome for three years and the number-one question he gets is whether he has met the Pope. “Oh, morning tea every Friday,” he jokes. For the record, he hasn’t met the Pope yet, but did confirm that as a newly-ordained deacon making headway for the priesthood, he’s “in the queue” to serve at a papal Mass in Rome. Living in Rome to see Pope Francis walk the streets at a moment’s notice was never part of the plan for Deacon Brendan. If he had his way, the Townsville-born Catholic would probably be at the top of his career in banking and swinging golf clubs to improve his single-figure handicap. More than 20 years ago, he felt a calling to the priesthood as a result of “a profound experience of God that completely changed my life”. “It’s a very long story but it was just an intense awareness that God is real, God loves us, we matter to him and that we’re required to respond,” Brendan said. That other direction was towards the priesthood, something the deacon first thought about in his early twenties. “I’m not one of these people that thought of the priesthood when I was six years old,” he said. “I started getting this thing of priesthood and I was twenty-two. After a period of discerning, he applied to study at the seminary in Perth, completing a degree in Theology, but left to discern a possible calling to religious life with the Discalced Carmelites. This also turned out to be the wrong path. Confused by the vocational mismatch, he took up a job in micro-finance for the St Vincent de Paul Society. “The call persisted and I couldn’t really find where to go … and then with my spiritual director, he said ‘The priesthood is the priesthood’,” Deacon Brendan said. 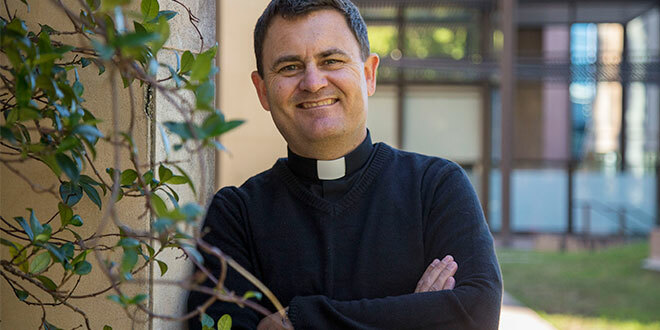 In 2014, two decades after that initial stirring for the priesthood, he re-entered the seminary but, to his surprise, not at Holy Spirit at Banyo like other men in Queensland. Instead Brisbane Archbishop Mark Coleridge sent the deacon, who was in his early 40s, to study at the Pontifical College of St Bede in Rome. Founded in the 1850s by the bishops of England and Wales, Beda College was set up to provide seminary training for Catholic converts from the Church of England. The college is now open to older Catholic men, like Deacon Brendan, who are studying for the priesthood later in life. The men study at the college on a four-year program before returning to their home dioceses for ordination. The average age of the 36 seminarians studying at Beda College now is early to mid-40s; some are parents, others are grandparents, but all have felt a calling to the priesthood later in life. “At Beda there’s no age limits put on,” Deacon Brendan said. “We have some men who are married and widowed so when a guy comes later in life there can be different reasons why. From his own experience, Deacon Brendan believes seminaries shouldn’t be quick to close the door on older men who want to become priests. “I think as a diocese, as long as there’s encouragement for guys that present older in life – certainly they all need to be examined as we all do to see if they’re suitable – but I don’t think we should just walk them through the door and go, ‘No’,” he said. “It happens in the corporate world; a guy walks through the door and they say ‘No, we’re looking for someone younger’. “It’s definitely something that you need to have an open mind and an open heart, that you just don’t know when God’s going to call the man. 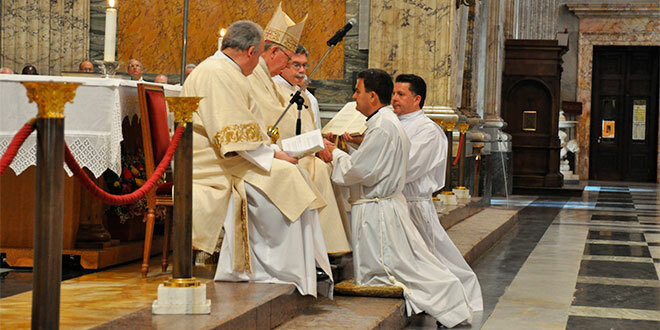 On June 15, Deacon Brendan was one of 12 men, including two Australians, who were ordained deacons in the Basilica of St Paul Outside the Walls. During the ordination, the men lay prostrate on the ground that lies above the tomb of St Paul, something of a “surreal” moment for Brisbane’s newest deacon. The fact he’s ordained as a deacon now and is finally heading towards priesthood has left Brendan speechless. “It’s mysterious; it’s so hard to put into words how it is,” he said of his ordination to the diaconate. “You feel humbled, you feel unworthy, you feel almost overwhelmed with the rightful expectations that the Church has of you. That job – to serve the Church in the name and person of Christ as a priest – is still unfolding for Brendan, who is on placement in Brisbane at Sunnybank parish until September. “I’m in my 40s now, I’m older and to be coming into ministry, but – I don’t know – better late than never,” the deacon said. “A part of me thinks it could have happened before now but hopefully the life experience I’ve had will stand me in good stead. In September Deacon Brendan will return to Rome for one more year of study before preparing for ordination day in June, 2018, at St Stephen’s Cathedral, 20 years after his initial calling. And there’s no doubting that his ordination day will be exponentially better than the day he meets Pope Francis. “But I’m here now, ordained, not a priest but as an ordained cleric,” Brendan said. “I’m incardinated for Brisbane, I’ve taken the life promises, I’m here.